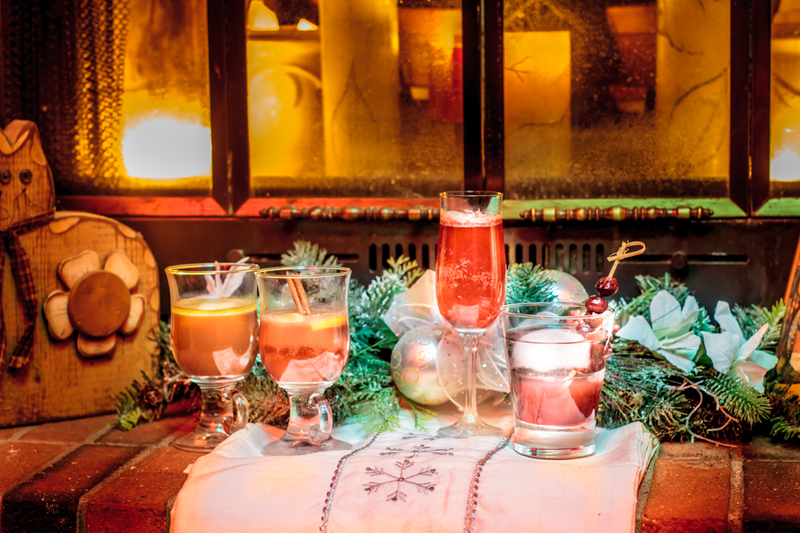 Festive Cranberry Drinks for the holidays. 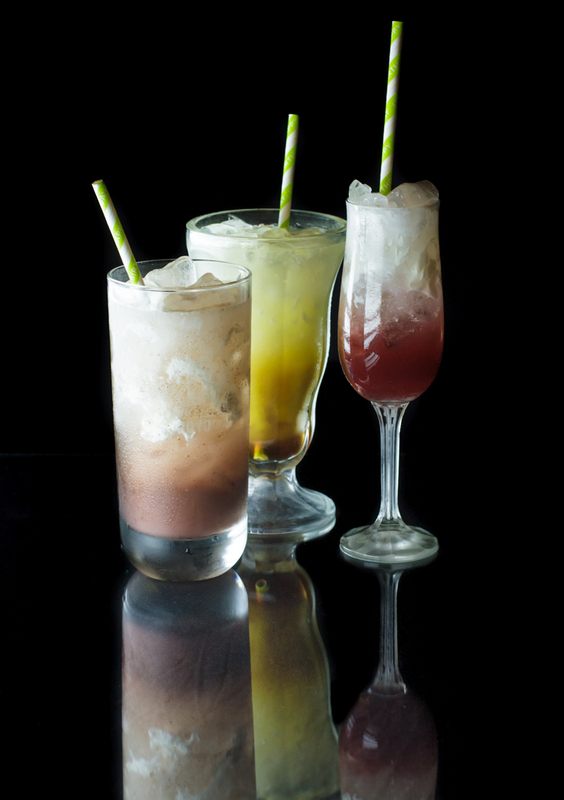 From left to right: Hot Buttered Cranberry Punch, Hot Buttered Rum Mix in cranberry juice, Cranberry Spritzer and Berry Little Mocktail. Cranberries are a common ingredient around Christmas, and cranberry punch is something I remember being offered at many a family gathering. There is something festive about imbibing red tart beverages in punch glasses or for super special occasions even the kids got to sip out of wine glasses filled with sparkling cranberry juice. In looking up virgin cranberry drinks, I found a plethora of recipes calling for a blend of orange and cranberry juice, a pairing that is tasty and often used. So this christmas I wanted to try something new, something that changed up the family cranberry drink and found some interesting options online. 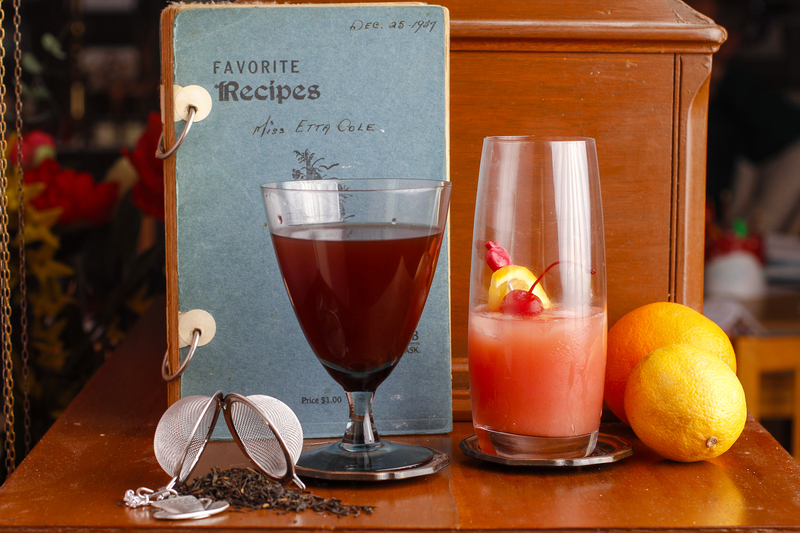 Martha Stewart pairs white cranberry juice with blackberry purée to create a cranberry spritzer that is dark and elegant. I was curious as to why this drink uses white cranberry juice. According to LiveStrong.com white cranberry juice is less tart in taste. We tried this recipe and found it light and just slightly sweet. The cranberry is more subtle than expected, coming in as the undertone of the drink, while the blackberry purée adds the colour and was the first flavour I noticed (this may be because the puree has a tendency to float a bit on the drink). The addition of sparkling water (or we used soda water) made the drink just slightly bubbly, but not like pop. I picked up a pint of rather expensive blackberries to make the purée, and cut the recipe in half to make the purée stretch further ( it would have made about 6 drinks at full size). The process of creating the purée wasn’t difficult but did create a lot of waste (seeds and pulp). This is definitely a special occasion drink, and not a cheap choice especially in winter when berries are not in season. Last Christmas I received a gift of hot buttered rum mix which we enjoyed with the accompanying rum, and for those who didn’t drink we made up an apple juice version of the drink so they could enjoy the hot spiced beverage with the rest of us. Because the drink is strong, the mix lasted me almost all year. In looking for interesting cranberry recipes, I came across this hot buttered cranberry option that uses a similar spice combination, and mixes this with cranberry jelly and pineapple juice. I was intrigued. Unlike the buttered rum recipe the spices, sugar and juices are heated for two hours to blend the spices then served with a pat of butter floating on the hot drink. You can find the recipe here. I decided to mix up a batch of the original hot buttered rum mix and compare the flavour by adding a tablespoon of this to some hot cranberry and pineapple juice. The recipe for the hot buttered rum mix can be found here. Heat juice in sauce pan until steaming, add rum mix either to full amount or by tsp to each cup as you serve. Stir and enjoy. The mix of cranberry jelly, pineapple juice and spices simmered for a couple hours created a very thick tasting drink, rich but without the brightness I expected from the juice. Perhaps the heating over time has something to do with that, but the result is far from the hot buttered rum that I enjoyed last Christmas. In comparison, using hot buttered rum mix stirred into heated cranberry and pineapple juice (1:1),came much closer to the taste I remembered, the drink was flavourful and bright with a hint of tartness. This was the drink that my family preferred of the two hot buttered recipes, and in my opinion the two hours of mulling was not worth the wait. Lastly for this christmas I wanted to try a virgin take on another Martha Stewart recipe, this one that originally calls for grapefruit vodka and champagne, black currant juice along with red cranberry juice. I had originally started to make this recipe back at thanksgiving, getting my cranberry garnishes all ready, but was unable to find black currant juice locally. As a small Christmas miracle black currant juice, or concentrate showed up in our store, and I could try out my experiment. Since vodka has no flavour, I simply substituted ruby red grapefruit juice for that element, and used club soda for the sparkle and fizz instead of champagne. I could have used sprite or gingerale but didn’t want to add any other flavours that were not in the original to get the closest to Martha’s recipe. You can find the original here. In saucepan on medium heat dissolve sugar in water. Add berries and simmer 5 minutes until softened and skins split. Drain, discarding liquid and freeze berries for at least two hours. Chill juices. Mix juices in cocktail shaker and pour into tall glass. Add soda water and garnish with a cocktail stick strung with candied cranberries. I found that this recipe was pretty mild and that the black current juice didn’t really lend much to the table when diluted according to the label. So I tried it again, but with the black currant concentrate (I used Ribena) undiluted and the result was a more interesting and created a better blend of berry flavours. Without the kick of the alcohol this drink is still pretty mild. I would like to revisit this again when I can get a hold of some grapefruit or citrus bitters, as I think it may add just that necessary touch to refine the virgin option of this drink. That being said, my kids enjoyed the drink and my eldest daughter asked if she could finish up the glass. Ratings for the virgin attempt to make this drink? See below! Taste: 3/5 Mild flavour, needs something to add kick. Ingredient finding: 5/5 all ingredients locally available at this time of year! Virgin Manhattans. Left to right: Sophisticated Smoked Manhttan, Tasty & Tart Manhattan. Now that I have a selection of bitters for use in drinks, I figured the first thing to do is determine how to use them in the most well know of drinks: a Manhattan. Manhattans are made with bourbon or whiskey, sweet vermouth and orange bitters. For the non-alcoholic choice, most sites give a juice based recipe for a virgin manhattan calling for cranberry, orange, cherry and lemon juice with orange bitters, which remind me a lot of a fruit punch. Since all the recipes had the same proportions I am using the recipe from DrinkMixer.com. The challenge for the Manhattan virgin cocktail is coming up with something to replace the whiskey or bourbon. If you google the taste of bourbon you find descriptions like “smoky, burnt toast, molasses” used to describe the taste, along with the flavour of cherry or cherry coke. Ok well sounds like marvellous stuff! Continuing the research I came across convivial.org which suggested a different take, using smoked tea and pomegranate juice to create a new experience using the idea of a smoky flavour from the original recipe. Ok sounds intriguing, and definitely not like fruit punch. But which is the preferred option? Time for some scientific taste testing – preferably on more than my little family of four. Well good thing I was visiting extended family!! This is the most commonly found recipe for a Virgin Manhattan. See the full recipe here. Each element of this drink lends to a tart bright flavour creating a juice based beverage that has a slight kick and is slightly astringent. The drink is pleasant, however the prevailing flavours are citrus and cranberry and the cherry flavour seems lost in the mix. To me this drinks seemed like a poncy cranberry juice – lovely for breakfast but not something I would offer as an alternative to alcoholic beverages at a party. Since the recipe calls for so little cherry juice (1/2 tsp) I am not sure what that element brings to the table. This is normally not something I have access to in Tumbler Ridge, and would have to choose to use either maraschino cherry juice (which cocktail:uk suggests), home-made cherry juice from frozen dark cherries or omit it all together. As I was down in the “big city” I commissioned my husband to find said beverage, and was surprised and amazed at the price (so was mom). I have trouble justifying $8/bottle for a half teaspoon of something, and am now endeavouring to find out what else I can use this super expensive juice for, as I can’t justify pouring glasses of this as a straight beverage. In order to determine scientifically what the cherry juice adds to the drink, I remade this recipe in triplicate: one without the juice, one with maraschino cherry syrup and one as directed; and retested the results. The cherry juice added colour to the drink making it darker, but did it add any discernible taste? According to my kids: Nope! The more discerning palates notices a nicer taste in the black cherry juice version – so we determined that the cost may be worth it if serving this drink to adults. Kid-o-metre 4.5/5 Either with or without the cherry juice, the kids rated this drink highly. Taste: 3.5/5 What’s with the .5 right? well it’s the result of science man. Simplicity: 5/5 A no brainer…unless you have to make your own bitters. Ingredient finding: 3/5 two ingredients that are “ship in only” for our small town. The second version I found online at convivial.org required some more challenging ingredients: Lapsang Souchong smoked black tea, a second black decaf tea, and pomegranate juice along with orange bitters and simple syrup and vanilla. I chose a rooibos de province from DavidsTea, since it’s fruity flavour would blend well with the pomegranate juice, and brewed up the two teas for the drink as per the instructions (2 bags tea per 6 oz boiled water). This drink did not go over well with the adults in our family the first time I made it. Me own mum likened the drink to musty mattresses, dad said it reminded him of burned food while camping, my husband took two sips and simply refused to drink the rest. I made the tea separately, about a week later, and realized that my original tea brew was stronger than it should have been, and over steeped. The recipe indicated using two bags of tea for 6 oz boiled water, I used loose tea and used 2 tsp per 6 oz of boiled water. It is possible that this smoked tea is stronger than a bag version, and that overstepping created a more acidic and bitter flavour. My tea loving father tried the tea plain from the first batch, made a face and stated it tasted like medicine. My tea loving niece tried the tea from the second batch, and finished the glass, enjoying the taste. I tried both and the first attempt was indeed an epic fail. The purpose of the smoked tea was to add the smokiness of the bourbon, but I have been told that bourbon isn’t smoky, it is sweet. The second batch of tea was indeed more tea like and had a hint of sweetness but the tea was made with only the regular amount called for (not double strength) which in this case was 1 1/4 tsp per 240 ml. 1 1/4 tsp Lapsang Souchong smoked black tea steeped for 3 minutes in 60z boiled water. 2 tsp decaf black tea (rooibos or other) steeped for up to 6 minutes in 6 oz boiled water. Steep both teas as directed. Mix juice bitters, syrup and vanilla with 1 1/2 oz black tea only. Taste the drink, and ad the smoky tea in small increments (up to 1 1/2 oz) to get just the right amount of smokiness without overpowering the drink – similar to bitters, the flavour is very powerful. We found that 1/2 -1 tsp was enough to lend the smoky flavour and maintain the sweetness and fruity flavour of the drink with the original over steeped double strength tea. When remade with the regular strength tea…. 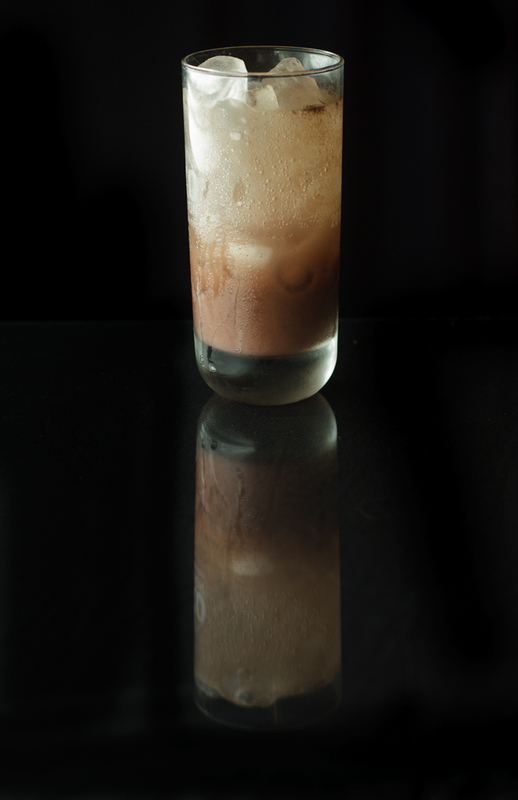 This drink, once perfected to a mild smoky taste was surprisingly easy to serve to both kids and adults. One adult still found the smoky flavour too much, but both kids rated this favourably and my youngest said it tasted like sour key candies. Compared to the first drink, due to the broad spectrum of opinions this drink rates lower. The original recipe calls this a Sophisticated Manhattan – which indicates that not every palate will appreciate this drink. Kid-o-metre 5/5 kids loved it once the smoky flavour was reduced. Who would have thunk it! Taste: 3.4/5 Slightly less preferred than the popular and common drink recipe. Simplicity: 2/5 Bitters (bottled or DIY), special tea brews (2 of them), and simple syrup needed. Ingredient finding: 2/5 the majority of these ingredients are not easily acquired in Tumbler Ridge. Would I make either of these regularly? Probalby not. Neither feels worth the time or cost to make, and I would definitely not bother serving either to guests. The first drink is simply not impressive or noteworthy, the second with the recommended adjustment is a nice drink – however pomegranate juice is simply to0 difficult to get in little northern communities. 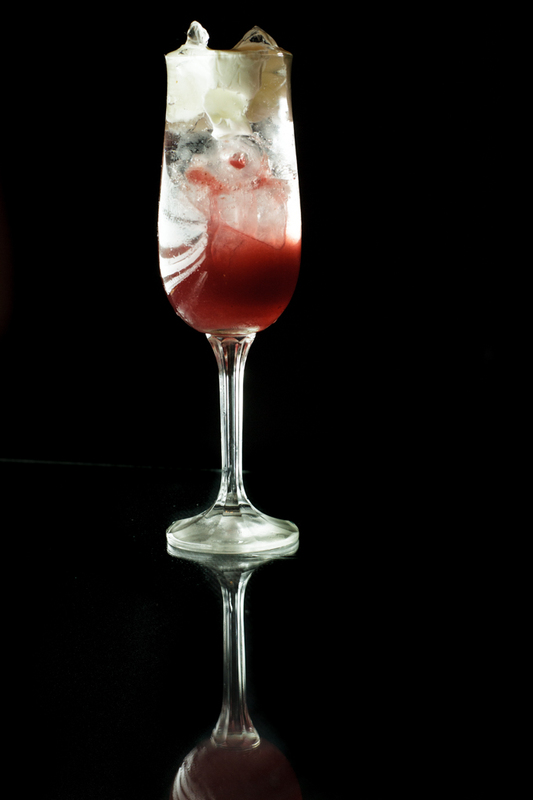 Sangrita – a spicy virgin accompaniment that often goes with tequila to cleans the palate. 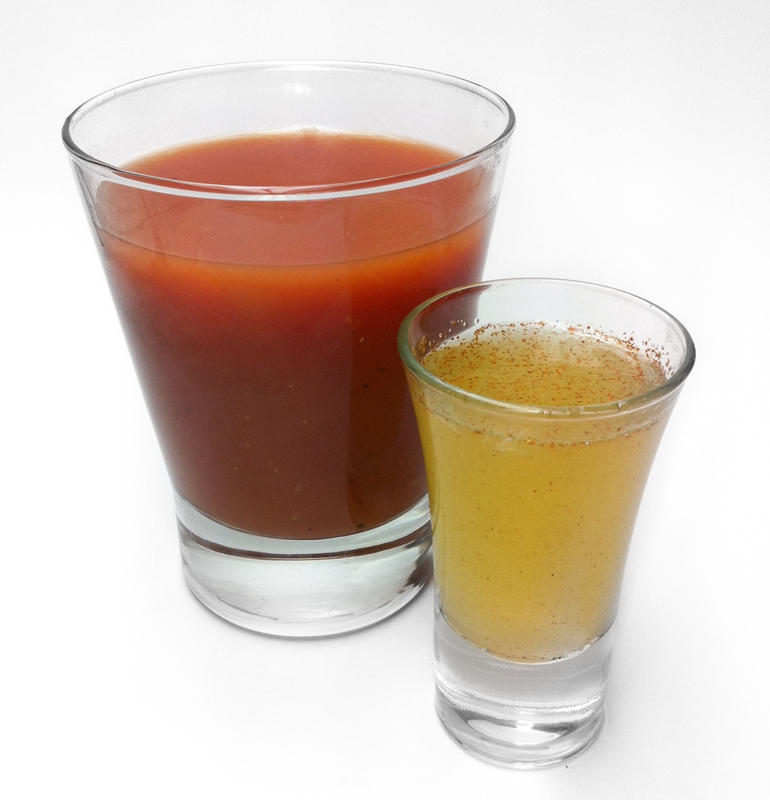 To the right – Virgin Spicy Lime shooter. In looking for spicy alternatives to a virgin caesar I came across this recipe at Liquor.com. Sangrita is normally served as a spicy accompaniment to tequila, as a chaser to cleanse the palate after the shot of strong liquor. The drink itself is non alcoholic and blends the flavours of grapefruit, tomato, orange and lime juice with a bite of spice. We decided to try it out, well the adults of the family did. For fun we decided to make a shot of a lime based sour mix with a hint of cayenne and honey, just to get some of the experience of mixing two drinks on the palate one after another. What did we think of the drink? With only two testers willing to try it, my results are pretty skewed. If I had made this for my niece she would have been all over it. However, with my husband not liking spicy drinks, the ratings dropped. From my perspective, I didn’t over do the spice in the drink or let it sit so long that it got too intense. This was fine for me, and I like the fact that one has control over the intensity of the spice simply by how long the drink infuses. Taste: 3/5 Husband not a fan because of the spice. Simplicity: 5/5 no special ingredients to prepare. If you decide to make up the shooter for the fun here is my recipe. Squeeze a half lime into a cocktail mixer, add remaining ingredients. Shake with ice and pour into shot glass. Pumpkin Pie Drinks. The favourite of the bunch: Pumpkin Pie Punch. Jack-o’lanterns are as traditional in our home at Halloween as candy and costumes. The kids and I sit around on newspaper scooping seeds and guts, drawing designs and then I dutifully do the cutting so that my two kids save their fingers from injury. We’ve made up to four pumpkins some years, each one created by and reflecting the personality of the designer, often fun and silly, sometimes animals, and the first years more like a Picasso or modern art piece as I try to make sense of the scribbles and swirls that are supposed to represent eyes and mouth, ears and nose and sometimes hair. But it’s about expression, and the sky is the limit. In order to come up with the best recipe, sans alcohol, I went first to see what people are mixing up. The common theme was to use pumpkin puree, vanilla (by way of vanilla vodka), simple syrup and whipped cream. Other additions included using a cream liqueur along with whipped cream. Pumpkin Lattes blend similar ingredients (pumpkin puree, milk, sweetener, vanilla) with pumpkin pie spice and coffee. Lattes are served hot and often recommend straining the pulp as part of the process. So what to do? We tested four combinations. 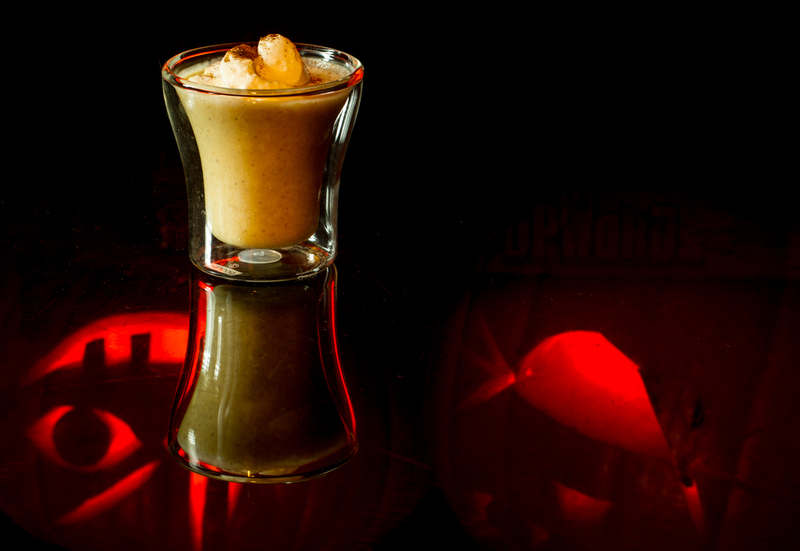 The first was the most simple, designed to taste close to a pumpkin martini or a drink called the Smashing Pumkin. Both these can be found here. True to the technique of a latte I mixed pumpkin juice (strained puree) with half and half cream in a 3:1 ratio, splashed in some simple syrup for sweetness and a drop or two of pure vanilla extract. Like a cocktail, I shook this with ice and served it over more ice. One child liked it, but it was super mild and milky. Not really something great when the alcohol is removed. Second test: add pumpkin pie spices, brown sugar and make something incorporating the pulp – thick and sweet. This was declared “like drinking pumpkin pie” and claimed as a contender. Ok. If it is gonna be like pie, it aught to have whipping cream on top and a dash of cinnamon or nutmeg. Yummy! While this is called a smoothie, it doesn’t use ice cream, crushed ice or yogurt. The thickness comes in the pumpkin puree and the whipping cream. Mix first four ingredients in a cocktail shaker with ice. Shake well. Strain into a espresso cup and top with a dollop of whipped cream and a sprinkle of spice of your choice. Serve. I loved this, and I wasn’t expecting to. The idea of drinking pumpkin puree cold seemed odd, not sure why after tasting it, since the taste and texture of this was delightful. Kids liked the drink, but it didn’t rate as the favourite for either of them. Second place for one daughter (the eldest) and hubby, didn’t rate for the youngest, and rated first for my choice. When making fresh pumpkin puree, cut your pumpkin up into chunks and toss it into a large pot with plenty of water. Boil until tender and let cool. Peel the skins off the pieces and toss the pulp into a blender. Process until finely pureed. Measure out 3 cups for the puree next step and save the rest for other pumpkin needs (soup, cake, muffins, pies). Naming this next drinks was a challenge. What do you call a drink with no bubbles, no alcohol or no bitters? Well since pumpkin is a fruit (yep!) let’s call it a punch. This drink is very similar to the smoothie, but in order to try to remove the thickness added by the puree, I strained it and used just the liquid. The thicker pulp is destined for muffins later this week when my daughter and I work on some baking together. Mix all ingredients in a cocktail shaker over ice. 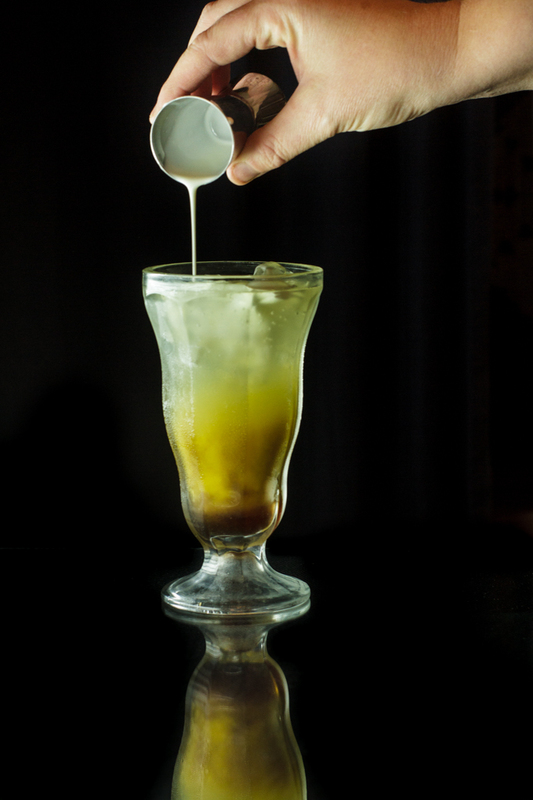 Strain over ice into a old fashioned glass and serve. The flavour of this drink is similar to the smoothie but the pumpkin is less distinct. The spices come across more strongly in this, as does the sweetness. I can see serving this with a cinnamon stick for a garnish (should have thought of that when I was shooting the picture) to dress it up, or serving it hot like the latte – for those who don’t like coffee. My youngest preferred this option the best as did my husband. The other two family members gave it a second place. Of all the drinks this had the best overall rating. The last drink we tried was a slush version of the smoothie. Because the flavours are very mild, this simply diluted the flavour and dulled the senses with the cold to the point where the drink failed to impress any of us. In fact it didn’t get consumed at all. So much for that idea! And why make things colder than they need to be at halloween, poor kids are out in the cold up here in the north, fighting snow and slush to knock on doors and say trick or treat! If you see my kids – a black cat with silver ears and a purple caped action figure – ask them how they like being test subjects for their mom’s wild drink inventions. 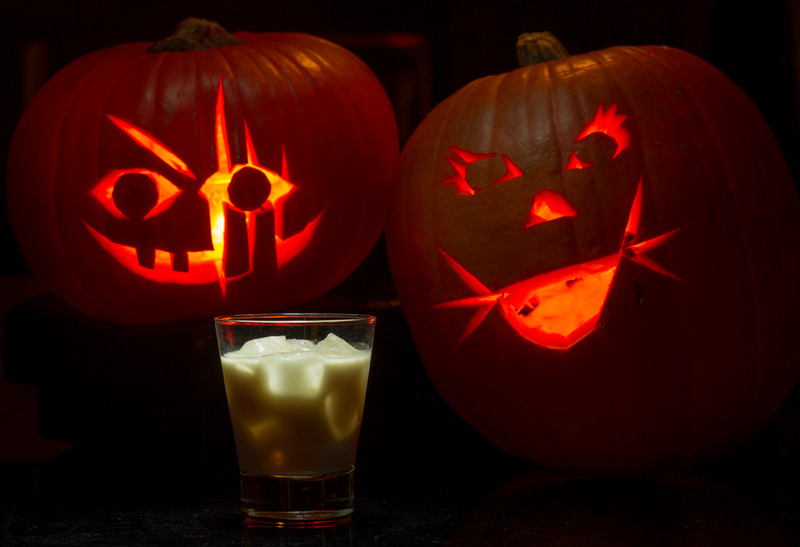 To the rest of you… Happy Halloween! I have been watching season three of Once Upon a Time and been considering the newly introduced character from Oz – the green with envy Wicked Witch of the West. So I wondered, what about a drink named after this infamous witch? It would have to be green of course, and have a hint of brown sugar. So, on a quest to see what can be created, I headed first to the internet to see what has been created. Turns out the only drink I could find with this name is a lemon vodka drink made for chugging at a frat party. Not even green, huh. The foundation of this sweet and sour drink is apple sour made with tart green apples, but with a twist of mint and lime thrown in. Rim a martini glass with apple juice and brown sugar. Pour into bottom licorice syrup. 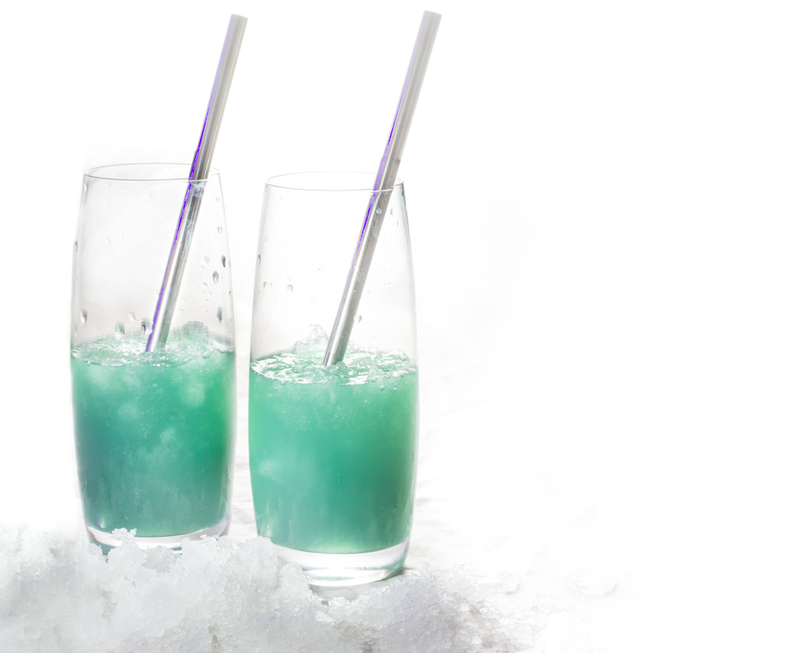 Mix brown sugar syrup, mint syrup and apple mint sour in a cocktail shaker with ice. With a straw or small dropper, carefully add up to 5 drops of concentrated chlorophyll. Watch that you are using just enough to colour the drink a deeper shade of green, this stuff is strong! Shake again, strain into glass and serve. The added mint gives a nice hint along with the lime to the apple beverage. The juice is tart, but not too. I felt that a splash of mint syrup was required to up the green and the sweetness, since too much brown sugar syrup would darken the drink. The drink needed just a hint more dark green though. So I decide to think outside the box and add just a tiny bit (and that’s the key) of liquid concentrated chlorophyll. This took me dripping tiny drops from the end of a straw as my bottle was happy to drip huge drops into the drink, overpowering the more delicate flavours with the health products flavour and over darkening the drink. With the blend of flavours, and when the licorice is swirled in the drink has a unique blend of apple, mint and licorice that is appealing — if you like licorice. 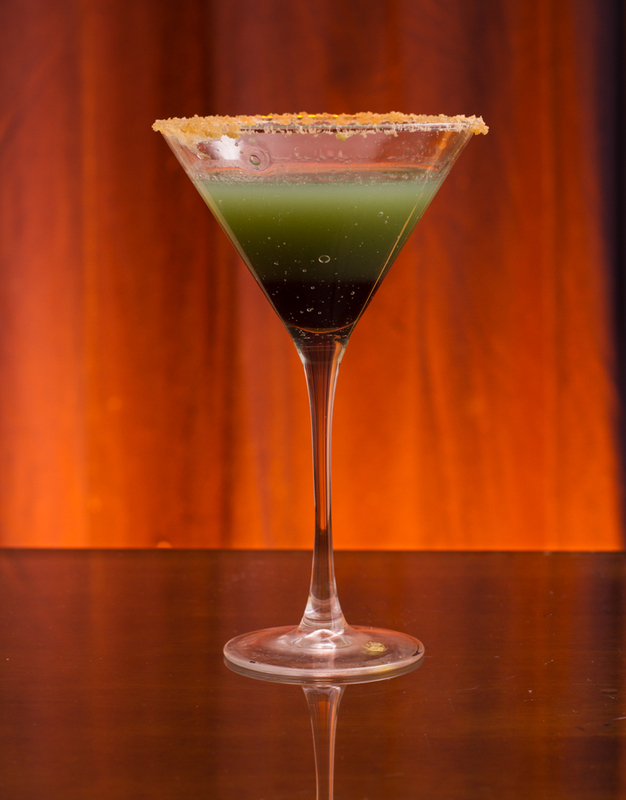 This could be made without the black to create a nice mint apple drink, but I found it tasted too much like a health juice and not enough like a martini. Taste: 3/5 hubby and I enjoyed it. Would love more input from what other think… please try it and comment! Simplicity: 1/5 Four of five ingredients requires creating yourself. Skill and precision necessary for layering. Ingredient finding: 3/5 Chlorophyl not available here, had to get it out of town. Fresh mint only available in summer/fall, luckily I had some left in my fridge. Throw all ingredient except water into a blender and pulse slowly increasing the speed until pulped into mush. Strain over wire double strainer using water to rinse out the remaining apple pulp. Push to squeeze out juice with the back of a spoon. When all juice is strained out, return pulp to pot with second amount water. Heat for 5 minutes then strain again and discard pulp. Store juice in airtight container for 1 week. Makes about 4 cups juice. This was a fun creative process, I hope you enjoyed it and would love to hear what your thoughts are on any of these inventions I’ve brewed up. With Halloween only a few day away, there are two drinks left to try. Stay tuned and happy brewing!